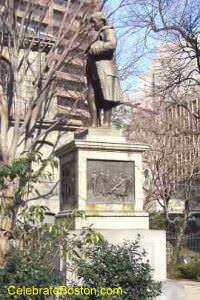 Along the Freedom Trail, just past King's Chapel at Old City Hall, is the statue of Benjamin Franklin (1706-1790). He was an author, diplomat, inventor, printer, and scientist. Benjamin Franklin was born in Boston in a house that was located at Milk and Washington Streets. As a young man, Ben Franklin was a printer and author by trade. At age 31, he was appointed as deputy postmaster in Philadelphia. He founded the American Philosophy Society there in 1743, which promoted science and technology development. He invented the Franklin Stove around 1744, and the lightning rod in 1752. In 1750, Benjamin Franklin was elected to the Pennsylvania Assembly. Franklin was involved in inter-colony conventions, and was eventually dispatched to England by Pennsylvania concerning taxation authority over private real property. He again returned to England for Pennsylvania in 1766, this time regarding the impact of the Stamp Act on the colonies. At the onset of the American Revolution, Benjamin Franklin was appointed to a committee to draft the Declaration of Independence, with John Adams, Thomas Jefferson, Robert Livingston, and Roger Sherman. In 1778, Ben Franklin negotiated a treaty of commerce and a defensive compact, with France. This event was a turning point in the Revolution, which in effect created a military alliance against Great Britain. After the Revolution, Franklin helped draft the U.S. Constitution. 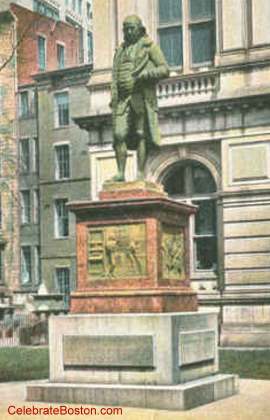 The Benjamin Franklin Statue was sculpted by Richard Greenough, and erected in 1856. The four bronze panels around the statue highlight Franklin's life as a printer, as a scientist, at the signing of the Declaration of Independence, and at the signing of the Treaty of Paris ending the Revolution. The statue rests on the site of the first public school in America, and in front of Boston's beautiful old city building.